You may have already traded in your bulky sweaters for breezy sundresses, but have you adjusted your makeup and skincare routine for the warm summer months? While you’re summerizing your wardrobe, don’t forget to adjust your makeup and skincare routines for summer, too. 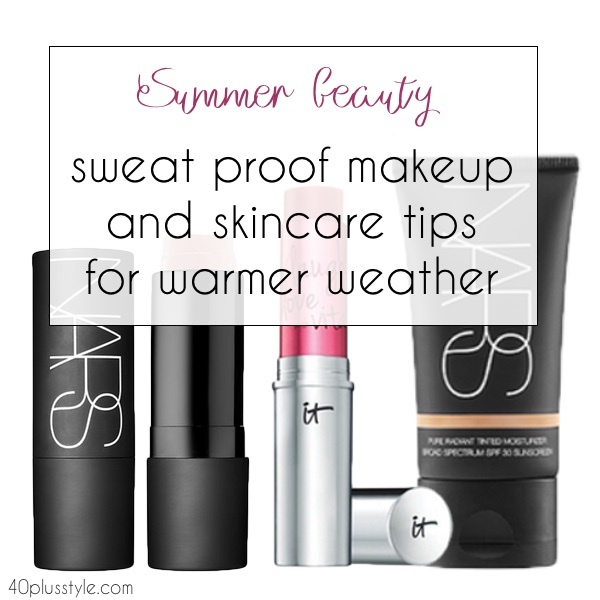 Here are our tips and favorite products for sweat-free summer makeup and beauty. Your clothing is lighter in the summer and your makeup and skincare routine should be, too. Replace heavy night creams with lightweight serums and gels. One product I love is Per-Fekt Eye Perfection Gel, an undereye serum with a metal applicator. It feels refreshing as the gel goes on. If you really want to feel decadent, store it in your refrigerator to keep it cool! Use a tinted moisturizer with an SPF. It will still give you coverage and sun protection, but the tinted moisturizer will give you a sheerer look, and feel less heavy in a humid environment. Sylvia loves and uses Laura Mercier’s tinted moisturizer. Trade your powered blush for a cheek stain or cream blush instead like It Cosmetics Vitality Flush Stain Stick. It goes on creamier and stays longer in hot weather than a powdered blush, and looks better on dewier skin. A waterproof mascara will stay put better than a non-waterproof formula. Try this L’Oreal Voluminous Waterproof mascara. If you have sensitive eyes, make sure to select a hypoallergenic brand. Especially if you live in a humid climate, stay away from lots of heavy eye makeup that can end up underneath your eyes instead of on your eyelids! A lighter eyeshadow will better match the lighter textures and colors of the season. Try a cream-based eye shadow in a pot like Clinique Touch Base for eyes, or opt for a lighter look by using your cheek stain or bronzer to give yourself a hint of color on your lids or along your crease. Check out How to Create a Flattering “No Makeup” Look for ideas. You’re hopefully wearing sunscreen daily. Which means any extra “bronzed” color will have to come from a bronzer and not from the sun. Add a hint of color by applying bronzer on your forehead, cheeks, bridge of your nose and chin, plus a bit on your eyelids to brighten your eyes. Don’t overdo it, a little goes a long way. You can use a bronzer stick that goes on creamy and gives a glint of color and glow. Add a hint of bronzer on your chest and shoulders too if you are wearing a short sleeved or open neck blouse. I recommend Nars the Multiple bronzing stick. It lasts a long time and comes in flattering colors. If you’re in an especially humid or hot climate, blotting papers like the NYX blotting papers are a great way to cut down on shine without wiping all your makeup off. Keep a supply in your purse too, so you can cut the shine and restore your makeup on the go. One of my favorite summer tips is to use a blotting powder that is actually 50SPF sunscreen. It goes on light and doesn’t add any color to your face. Truly invisible. It blots any shininess and gives you sun protection at the same time. My favorite is Sunforgettable brush on sunscreen. I love to change my perfume to a lighter, sweeter fragrance for the summer. There are some wonderful botanical-based scents that go on with a rollerball. They are also a convenient size in case you are traveling so you can take them along on your trip. I love the Pacifica Gardenia Roll on perfume. The scent smells like a summer vacation at the beach. Butter London’s Sheer Wisdom Nail Tinted Moisturizer comes in many shades to match your skin tone and gives your nails a nice finished shine. You can find some of our favorite summer makeup and beauty products below.